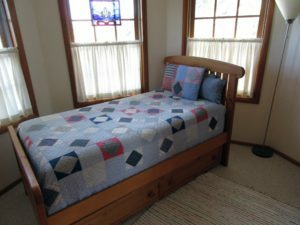 Just when I least expected it, a most relaxing, wonderful haven that is the Muley Twist Inn gave me an unexpected quilt fix. The husband and I arrived here after a long day hiking in Capitol Reef National Park. The inn Carl picked out is off the beaten track, outside Teasdale, Utah. 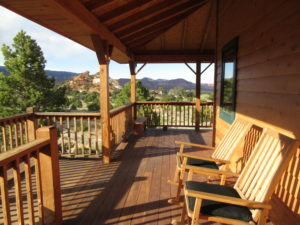 The vistas are better than the guide books promise, and I began writing this post on the front porch overlooking a stunning view of low mountains and Ponderosa pines, the natural colors I’d been seeing for days. 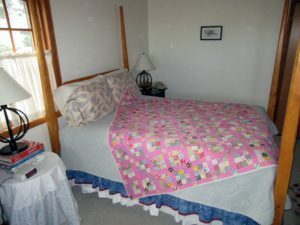 Innkeeper Penny, upon learning of my interest in quilts, let me into an adjacent bedroom where quilts were spread and stacked. 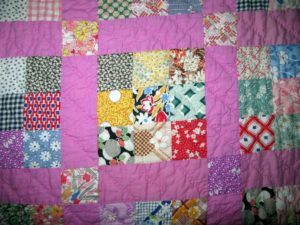 Nine Patch may be the quintessential plain patchwork pattern, but the bubble-gum pink lattice and jazzy prints provide kicky refreshment. Experts will look at those prints and help me date this charmer…1950s? Made me think of how Southwest artists translate the landscape into vibrant vistas. Like my favorite local artist, Paula Swain. 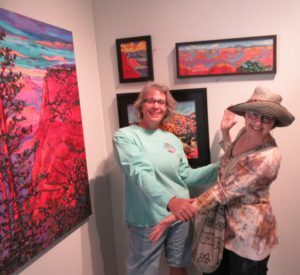 Ran into her at Gallery 24, in Torrey, UT–right after I’d purchased one of her works. The husband and I had a really hard time picking the one we wanted! Here it is hanging on our wall so I can enjoy “Capitol Reefs Color” as I eat breakfast. Paula told me that she was raised in a family that went out to do plein air painting at every opportunity. Her father pushed her to use a realistic palette, and she resisted. 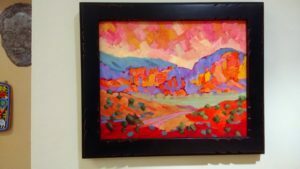 It’s only since he passed away that she’s felt liberated to take artistic license and go wild with color, putting her own twist on the tradition of landscape painting. 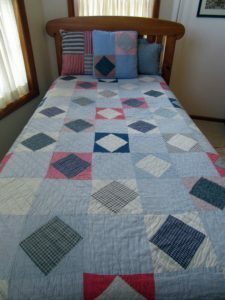 This entry was posted on Saturday, June 10th, 2017 at 8:57 am	and is filed under Antique & Vintage, Color, Inspiration. You can follow any responses to this entry through the RSS 2.0 feed. You can leave a response, or trackback from your own site.